Description: Level: Process kanban, kaizen and quality inspection engineers and managers, Visual Factory Management (VFM) and Lead-time Reduction process engineers, lean factory design, automation and control engineers, industrial engineers, JIT software / IT developers, operations managers, team leaders, workforce productivity improvement managers, interested in eliminating unnecessary waste, lost time, and workers' compensation costs. Also ideal for undergraduate / graduate education and research learning about lean VFM, Kanban, quality inspection / assurance, waste reduction and dynamic JIT factory production control. 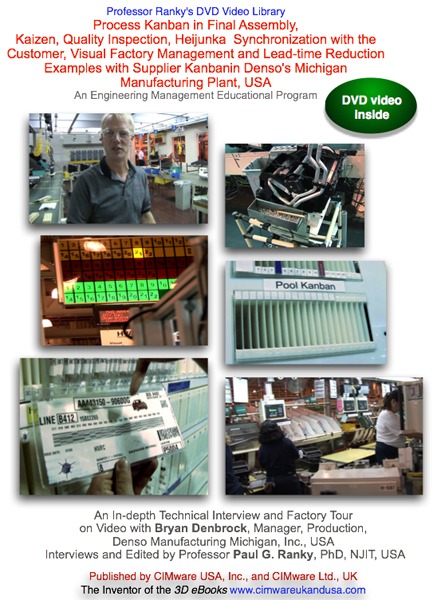 Contents: This publication is a professional quality DVD video factory tour, covering Denso lean manufacturing system solutions, with kanban, kaizen, quality inspection, heijunka synchronization methods and actual industrial solutions in a Visual Factory Management & Control (VFM) framework. VFM is an integrated set of methods and technologies for the purpose of reducing waste at all levels, improving profitability, increasing lean production control, product & process quality, productivity, safety, on-demand / just-in-time (JIT) Kanban production / delivery, and employee morale in a factory, or virtually in any business. VFM and factory automation typically begins by following an integrated process, requirements, and risk analysis method, embedded into a statistical analysis and multimedia framework. As a result, the team will have a clear picture about what needs to be done, when, and how. The next step is typically the implementation of a 'Five S', a 'Lean Six-Sigma', and a 'Monozukuri' program. (See more about these methods and technologies in Professor Ranky's Library.) See also Part 1 of this program! System Requirements: DVD-ROM: NTSC standard definition (SD) DVD video player for TV, or computer. Approximate length 28 minutes, in 16:9 widescreen format, also playable on a 4:3 regular screen, or any good computer screen (800 x 600 resolution, or better). Furthermore available in PAL DVD video, in streamed digital, and Apple Video iPod formats. HD (high-definition NTSC and PAL) formats are also available. See also Part 1 of this program!